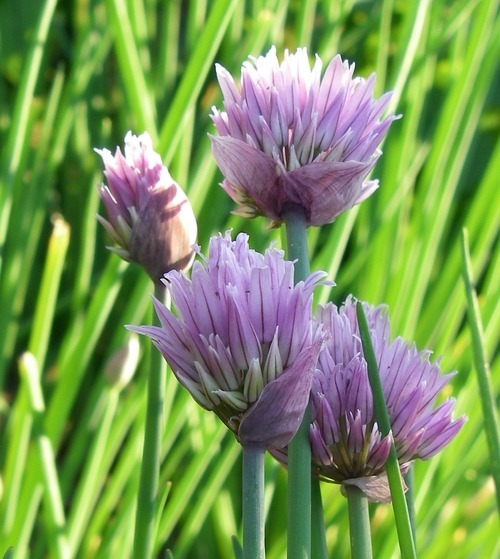 Ready right now in local gardens is the best garnish ever…..chive blossoms! The tiny purple flowers that make up a chive blossom will add an unexpected visual delight and a gentle onion flavour to your food. Just separate the flowers from a blossom and sprinkle evenly over a couple of servings of pasta, salad or anything savoury. After picking chive blossoms, you can extend their freshness by a few days by keeping them in some water like you would any other flower. Urban Huntress Tip: I find a sprinkle of feta and some fresh herbs will make even the most humble dish look special and extra tasty. Plus, it’ll make you feel all Continental and fancy-like. I recommend buying your feta at Parthenon Supermarket at 3080 West Broadway. Try my favourite, the creamy Bulgarian Sheep Feta. It’s only $1.79 per 100g. In my opinion, Parthenon has the best quality and prices (a divine combo) for feta and olives in Vancouver. They have a great selection of both. Go and ask for samples. The white feta and the purple chive blossoms are a gorgeous combination.